The state attorney general says Trump Tower is taking water from the Chicago River and releasing it "without any regard" to the environmental impact. 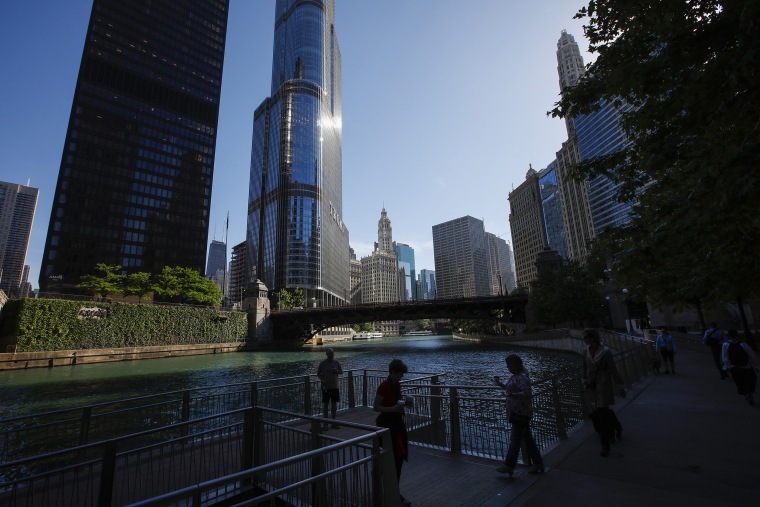 The Illinois attorney general has filed a lawsuit against Trump Tower in Chicago, alleging that it is taking in and releasing millions of gallons of water into the Chicago River without having conducted required studies on pollution or the impact on fish. Attorney General Lisa Madigan, a Democrat, said she filed the lawsuit in Cook County Circuit Court. She said that the building takes in almost 20 million gallons of water per day from the river to cool the property's heating and ventilation systems, and that heated water is later discarded into the river. Madigan's office also said that federal law requires "extensive studies of Chicago River fish populations and the impact of the building’s water intake system" and that the property failed to submit study results to the Illinois Environmental Protection Agency in 2013. It also says that Trump Tower's National Pollutant Discharge Elimination System permit expired in Aug. 31, 2017. "Trump Tower continues to take millions of gallons of water from the Chicago River every day without a permit and without any regard to how it may be impacting the river’s ecosystem," Madigan said in a news release. "I filed my lawsuit to make sure Trump Tower cannot continue violating the law." A spokesperson for the Trump Organization said in a statement that the issue could have been handled in other ways instead of a lawsuit. "We are disappointed that the Illinois attorney general would choose to file this suit considering such items are generally handled at the administrative level," the spokesperson said in an email. "One can only conclude that this decision was motivated by politics." Maura Possley, a spokeswoman for Madigan's office, said in response that "we previously brought an action against the Trump Tower in 2012” over the issue. Donald Trump announced his presidential campaign in June of 2015. Madigan, first elected in 2003, announced in September that she would not seek re-election, NBC Chicago reported. The attorney general said in Tuesday's statement that in 2012 she filed a complaint with the Illinois Pollution Control Board over heated water discharged into the river without a National Pollutant Discharge Elimination System permit, and that it was settled and Trump Tower Chicago was ordered to obtain a permit and pay a fine. The lawsuit seeks an order requiring that Trump Tower "immediately take the necessary actions that will result in a final and permanent abatement of the violations” and for fines to be imposed for the alleged violations. Madigan's office noted that the Sierra Club and the Friends of the Chicago River had also announced plans to sue over the issue. Representatives for those two groups said they would work with the attorney general's office, Reuters reported. "Friends of the Chicago River trusts that the AG’s office will secure a good result with their suit and will hold the Trump International Hotel & Tower accountable," Friends of the Chicago River Executive Director Margaret Frisbie said in a statement. "We look forward to working with them to assure an outcome that addresses the permit violations, protects additional aquatic life from harm, and makes the river healthier for fish."